Hypersonic Sound (HSS) technology does for sound what lasers did for light - provide a far more focused stream of energy over a greater distance with less dispersion. Inventor Woody Norris (shown below with his invention) has received several awards for the idea, including a Grand Prize for inventions from Popular Science: the Segway took second that same year. He was awarded the $500,000 Lemelson-MIT prize this past week. In a recent demonstration at the American Technology Corporation, the speaker (shown above) was pointed at someone one hundred yards away. The listener heard the sound as if through headphones - despite the ambient noise from a nearby freeway - and people two feet to either side heard nothing. Sound from an HSS speaker can travel up to 150 yards without distortion or loss of volume; anyone outside the beam path hears nothing. The piezoelectric transducer emits sound at frequencies above the human ear's 20,000-cycle threshold. 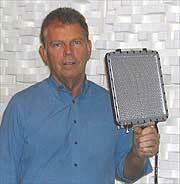 Unlike low-frequency waves, the high-frequency signals don't spread out as they travel through air. Yet they do interact with the air to induce a related set of ultrasonic waves. These waves combine with the original waves, interfering to create an audible signal, focused into a beam. Cirque de Solei is considering using it to beam instructions to trapeze artists.